A new addition at JetPens is this Ohto Dude Fountain Pen, which looks amazing. It's a full-sized fountain pen with a hexagonal shape, and the coated brass body gives it some heft. I love the deep purple color and metallic sheen of this pen. The six-sided barrel doesn't feel strange when you're holding it as the edges are slightly rounded so it doesn't jab your palm. The black plastic section is hard and adds a nice contrast to the silver and purple colors. The pen cap and barrel end have silver tassies encasing small silver rounds, a smooth, modern design but very reminiscent of the jewels you find on a vintage pen. The cap clicks onto the body securely, and the bevelled silver rounds give the pen a "nipped waist" look. There's a very solid rectangular metal clip that echoes the straight line of the barrel side, giving it a spare look. A fussy clip would look out of place on such a modern-looking pen. The Ohto Dude takes short international cartridges or you can add a converter to your cart and use bottled ink, which is what I did. How does it write? The fine nib is more of a Western than Japanese fine and the line looks to be about a 0.4mm or 0.5mm width, about a medium in gel ink pens. While the nib started off as hard as a nail, with some use it wasn't quite so stiff. Definitely nowhere near a flex nib, but I found there was great ink flow and no skipping or dry start. This is a great-looking pen with four color choices, including blue, black, and silver. It's very affordable, so if you're looking for a new fountain pen take a look. I was writing up this post on the Monami Super Gel-Q Gel Ink Pen with blue-black ink when I noticed the Pen Addict beat me to it with a review on Friday (great minds and all that). I decided to still go with mine for one reason, which I'll get to later. First, thanks to JetPens for sending this pen to me, I appreciate their generosity. I don't think I have to urge many of you to visit their web site, but if you haven't visited please take a look. I can't think of any site I like wandering around more than JetPens. On to the review. Like many others I'm a big fan of the Pilot Hi-Tec-C, so I definitely liked the look of the Monami Super Gel-Q. I'd reviewed a set of their Love Pet Pens, which have one of the best designs I've ever seen. The Pet Pens tip is a needle point but the colors give it a bold line, which I liked. The Super Gel-Q Gel Ink Pen also has a needle point tip and the 0.4mm line is thin, making this perfect if you want to do some very fine writing or drawing. I love the blue-black ink color, and I thought it wrote very well. The Super Gel-Q pen boasts that the ink dries three times quicker and in my test there was no smudging at all. So far so good, but as Brad notes in his review there was a problem with the pen: it stopped writing. That hadn't been my experience on the first try, so I decided to write another page and see what happened. The pen started out fine, and then the ink stopped. In the above picture I think you can see how hard I pressed down on the paper to get the ink flowing, but no matter what I did it wouldn't write. In the end I got the ink flowing by rolling the tip between my fingers and warming it a bit. I was annoyed and my fingers were ink-stained after that, and I have to say I'm disappointed in this pen. The design is cool, the color selection is good, and I liked the needle point tip--but the pen won't write consistently and I can't really recommend it. Maybe it's there's a problem with the blue-black pens, a bad batch of ink or something. But if you decide to take one with you to a meeting or something, bring another pen just in case. 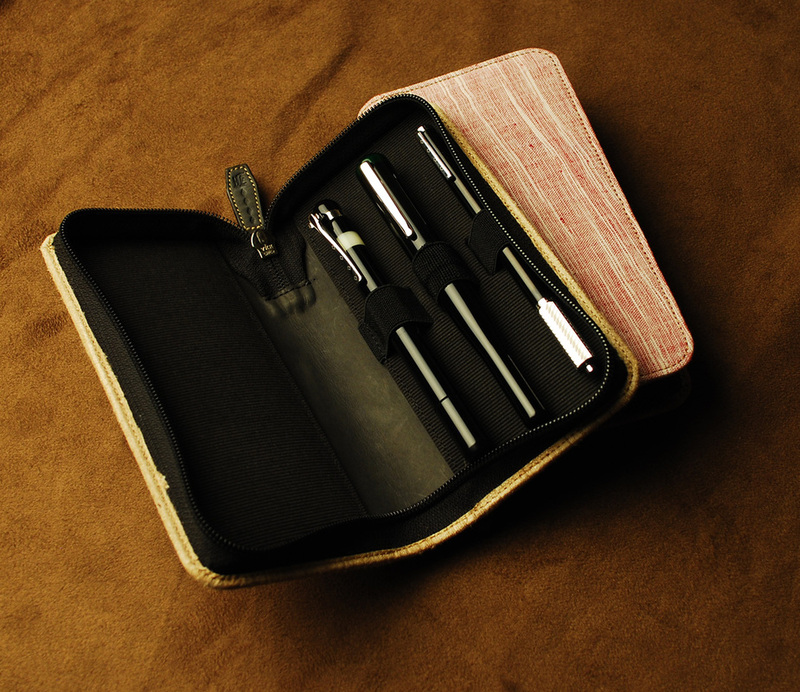 These look nice, pen cases that hold 3 pens. 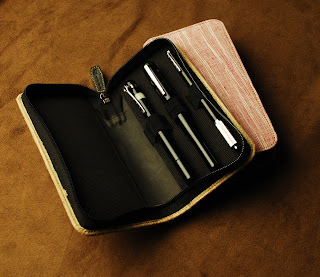 They're made from striated cotton fabrics the gang at Franklin-Christoph found in Mumbai. 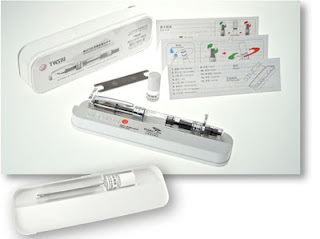 Goldspot Pens is having a giveaway and it's a great one, a TWSBI 540 fountain pen. Go take a look and sign up for their email newsletter to enter. Thanks to JetPens for sending me this Dong-A Cronix Ballpoint Pen, which has a big 1.0mm tip and uses a quick-dry, hybrid ink that I was curious to try out. The Cronix is a light pen and has a soft rubber grip that provides both comfort and stability in writing, for people like me who tend to hold their pens too tight and destroy the soft sections. The 1.0mm tip offers a nice line, not as wide as a gel ink 1.0mm but definitely a width I like. Trying it out I found that the ink wasn't as quick-drying as I expected. Maybe the heat had something to do with that, as I left it near a window that gets full sun most of the day and that might have effected the ink. More likely it was the Clairefontaine 90gsm paper I used to test it, which is probably too dense for a ballpoint ink. I'll have to try it on a regular office supply notepad like you would find in an office, but for some reason I can't find any so I'll have to wait. I think the Cronix would work very well for everyday use, but not on paper meant for fountain pens. One thing I liked is that it didn't leave any ink blobs on the paper, which is a big problem with ballpoints and smudging. The side of my hand is always covered in ink when I use a ballpoint since the ink blob hasn't dried by the time I return to that place. So the Cronix solves that problem very nicely. You get three color choices (black, blue, red), and this blue ink is deep and rich. I was impressed with how good the color is, because thin lines don't show the ink as well but this one does. If you like ballpoints and are looking for something different that's easy on the pocketbook, do think about a Dong-A Cronix Ballpoint. This just came in the mail from Tom Oddo of Goldspot Pens and Oddo Ink, one of the best ideas I've seen for fountain pen lovers: the InkJournal, a pocket-sized notebook to record pen and ink combinations, as well as space for a color swab and a comments section. I've kept track of my pen/ink combinations in a small notebook which eventually I misplaced. This is more detailed than I used before, and I like Tom's idea of giving fountain pen lovers their own specialized journal. The first two pages of the InkJournal are an index with page numbers, so you can find each pen and ink combination easily. The journal is made from 100% recycled papers, printed with vegetable-based inks, and the cover is a very stiff 18 pt chipboard. The interior pages are 70# text weight, and fountain pens do work well on the paper. There's a lot of of room to show off your pen/ink combinations, with all the necessary information you'll need (date, dry time), while the second page is blank for notes or additional comments. There was some bleed through with this ink, an Everflo I think, but it wasn't too bad and didn't detract from the overall great paper. The 3.5" x 5" InkJournal allows you to catalog 15 pen/ink records, so you have 45 combinations you can keep track of for future reference. The InkJournal's front cover is a drawing of a 14k nib being dipped into an ink bottle, while the inside page designs are elegant and spare. Each 3-pack of journals includes an instructional blotter card explaining some basic ink terminology (shading, saturation, flow). The card is thick and can be placed behind the page you are writing on, giving a firmer writing surface while also preventing any ink bleed through. And since it's unfinished matte paper the card makes a great blotter, although it's so nicely done I'd hate to ruin it. Besides using this for fountain pens, I don't see why you can't record your favorite gel inks or other pens. It's a great way to see the way a pen writes or to note a particular color. I'd use it to test out various blue/black gel ink pens, to see how closely they match. Do check out the Facebook page, where you're invited to post scans of your pen and ink pages. That would be a lot of fun to see, and I hope Tom gets a lot of photos on his page. If you want a new journal dedicated to keeping your pen and ink combinations in elegant order, the InkJournal is something you want to add to your notebook collection. Another item that came from JetPens is this Pink Sailor Clear Candy Fountain Pen with a fine nib. The pen celebrate's the company's centennial, and it's a beautiful and colorful pen. The pink in particular looks like it should be surrounded by baby chicks and bunnies it's so cute. These are inexpensive as fountain pens go, but the nib is as high-quality as you can get. It's a Japanese fine, which puts it in the Western extra-fine category, and it writes beautifully. I didn't feel like using a converter, which is available, but went with the black Sailor ink cartridge that came with it. Popped that in and the nib wrote from the first stroke, with no false starts or skipping, so I give this high marks for ink flow. The cap screws onto the barrel, so no worries about it coming off. There's a great selection of colors, 15 in all including metallics, clear, white with accent colors, and clear with accent colors. There's only one nib size, however, which is the fine. One thing that's different in my pen from the JetPens website is the cap. Mine has a blue dot and star, while the website shows those in the same pink color as the pen body. This may be the case with the other pens, but it doesn't detract from the overall look.